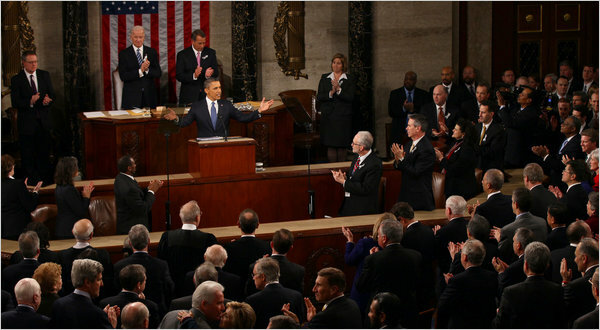 Last night, President Obama crystallized a new moment in U.S. political and economic history. The president is declaring it the “new Sputnik moment,” but whatever the label, it represents a major development in U.S. politics. The catalyzing force behind this trend is the rise of China and the aftermath of the Great Recession, which is quickly producing new political fault lines. Just as the rise of the Soviet Union caused a fundamental political realignment in the United States, so the rapid rise of China is causing another today. This realignment is just beginning, but one of the clearest implications is the rise of a new national economic strategy based on “innovation economics.” Instead of emphasizing spending cuts, even in the face of the Tea Party and new Republican House, Obama strongly promoted an active, innovation-centric federal strategy at the front and center of his agenda – a first for any modern president. By embracing an investment-centric strategy, Obama adopted a growing expert consensus: modern economic growth primarily emerges from technological innovation, and the federal government plays a central role in innovation. The information technology revolution was grounded in federal investments in microchips and the Internet – especially by the Department of Defense – and so were major growth sectors like aviation, biotech, and others. The new energy and climate movement will not be led by “climate hawks,” as David Roberts of Grist recently coined. Rather it will be led by innovation hawks, most recently represented by the American Energy Innovation Council and the President’s Council of Advisors on Science and Technology. Indeed, even after the collapse of cap and trade, the rapid decline of climate-centrism was highlighted by Obama’s choice to omit “climate change” from his speech entirely. Innovation hawks are reemerging today, but they held a much stronger position throughout the Cold War. During this period, the success of federal investment shared a strong bipartisan history, from President Eisenhower’s interstate highway system, to President Kennedy’s Apollo Project, to President Reagan’s defense technology efforts. This industrial and innovation policy was often conducted by DOD under political radar. The Soviet threat produced a powerful political consensus behind defense spending, even if parts of it represented industrial policy. Unfortunately, beginning in the Reagan administration, neoliberal doctrine began to discredit the role of public investment. And when the Soviet threat dissolved, the underlying investment imperative disappeared. On one hand, the diminished threat increased political polarization and anti-government sentiment, beginning with the 1994 mid-term election. On the other hand, the Soviet collapse fueled the triumphal neoconservative movement, represented by Francis Fukuyama’s “The End of History” and Charles Krauthammer’s “The Unipolar Moment,” which argued that U.S. dominance was complete. Despite the economic success during the Clinton administration – much of which came from past federal investments in information technology – Reaganomics and neoconservatism won the day, and the Bush administration was installed. September 11th crystallized the neoconservative foreign policy agenda, and the invasion of Iraq dominated the administration, distracting from “nation-building” at home and the need to guard against financial crisis. Throughout this period, a significant part of the U.S. innovation system was dismantled. Federal research and development as a portion of GDP declined by over 50 percent since 1964. Infrastructure investment declined from 3 percent of GDP between 1950-70 to less than 2 percent since 1980, and the American Society of Civil Engineers now calls for $2.2 trillion of upgrades. Meanwhile, the U.S. fell behind in STEM education and clean energy technology, among other sectors. The rise and fall of the Soviet Union, the twilight of American unipolarity, the foreign terrorist threat – each of these foreign policy events caused realignment in the U.S. polity. But Fukuyama and Krauthammer were wrong: history didn’t end, and unipolarity only lasted a brief moment, if it ever existed at all. Today, in the aftermath of the Great Recession, we are witnessing another realignment with the rise of the next great power – one which may have far greater implications than Sputnik. If he’s correct, and if China produces the same type of public investment imperative as the Soviet Union once did, then the current Tea Party and Republican resurgence is doomed. Either the party itself will collapse under its own weight, or more hopefully, a new brand of “innovation conservatives” will rise within the party and take over the reins. Conservative intellectuals like David Brooks, Steven Hayward, and George Will are already starting this trend, but they’re still a small minority. If he’s wrong, and the current political polarization and anti-government sentiment reflects a deeper trend, then the United States is most likely destined for slow but steady decline. This would imply an inability to confront the grand challenges of the century, including global energy transformation and continued role as the underwriter of international security, among others.